It’s so cold here at the moment, I must admit that although I am a skirt and dress girl all the way, the temperature has forced me into my jeans and jumpers rather more than usual. Bored with always wearing the same tops I decided to make a much overdue pattern that I have wanted to sew for ages. It’s the Hemlock Tee by Grainline Studios. Better still it’s absolutely free – the lovely guys at Grainline will kindly send you a free download if you sign up to receive the newsletters on their website here . 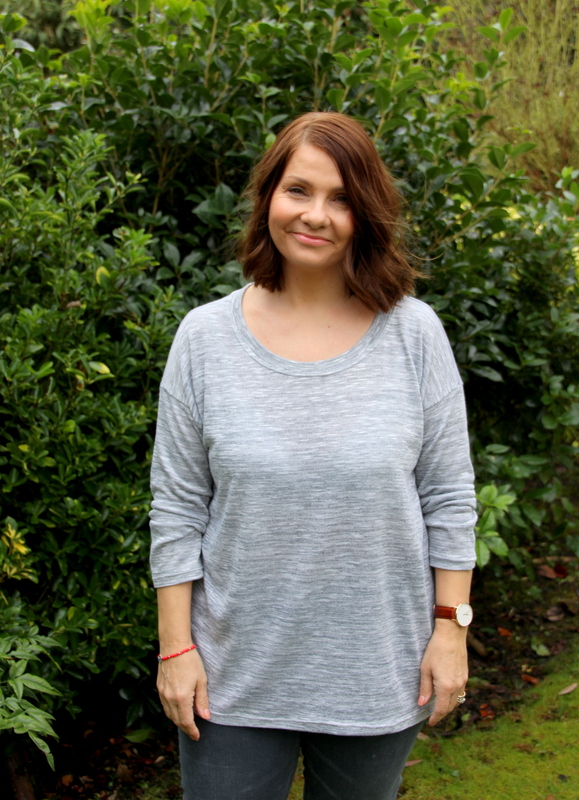 It’s a cute slouchy long sleeved tee, one size fits all, designed to be worn loose and perfect for drapey knit fabrics. 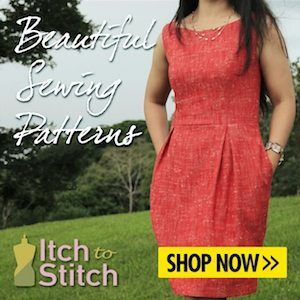 The PDF printed out beautifully, lovely clear instructions, measurements, cutting layouts and tips for sewing with knits accompany the simple pattern pieces themselves. The pattern itself only consists of a front piece, a back piece, a sleeve and a neck band. Simple. I also had fun cutting this one out when I rediscovered a forgotten guillotine that my husband has in the office. I will definitely use this again when cutting out my PDF’s. Because of the slippery, stretchy nature of the jersey knit I was using I decided to use my rotary cutter and mat to cut out the pattern pieces. This is nice and quick and I love how neat the fabric cuts out using this technique. Also just to mention as this is a one size only pattern there is no pattern tracing to your size necessary- again a time saving winner! I found that using lots of pins to keep things in place helped me lots with this project. Jersey is notoriously stretchy and also the cut edges have a tendency to curl over a little so use as many pins as you can to help you keep things secure. I chose to use my ball point pins so that there would be no damage to the fibres of the jersey. This top was a dream to sew. So quick to make I couldn’t believe it. I did refer to the Grainline Studios tutorial before I started here and one thing in particular from this that I found helpful and used in my make were the tips regarding the neckband. I think I might have struggled if I hadn’t used the techniques recommended in this tutorial. I used my overlocker/serger throughout this project. Again such a timesaver, and I love any excuse to use it! It coped with the jersey wonderfully. No stretching, nothing. To finish off the neck band, sleeves and bottom hem I used my fancy new twin needle (ball point) on my regular sewing machine. Again I was so pleased with the result, although I was a little unclear as to whether the twin line of stitching should sit below the neck band seam or whether to stitch is so that the twin lines of stitching ‘straddled’ the neck band seam. In the end I opted to sew just below the seam line and I’m happy with how neat and finished this makes the neck line look. I don’t think it would have mattered if I had chosen the other option either. Just a preference I guess. Any way this gives a really professional finish to your work. I do know that I will be sewing this top again for sure! 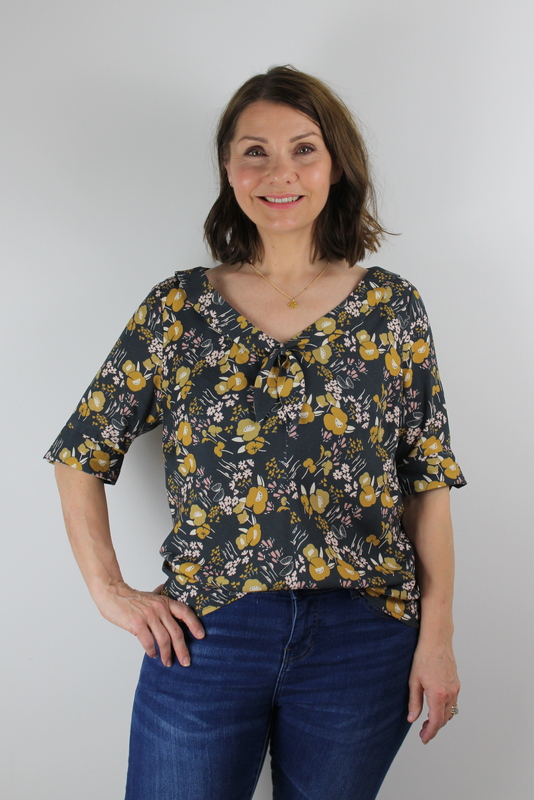 The grey marl fabric that I used was only £2 from Stuarts Fabrics on Leicester Market, and what with the pattern being free this was a real bargain top! Love the relaxed fit and the dropped shoulders. And before I go, here’s one for the cat lovers amongst you! I love, love, love this top and can’t wait to make more. I would thoroughly recommend it to any beginner because of its simplicity and also how quickly it comes together. I look forward to making the Scout Tee by Grainline Studios which I recently purchased but as this is a short sleeve I may wait until the weather warms up a bit. I must admit I like the look of the Moss skirt too – am definitely interested in sewing more Grainline projects soon! 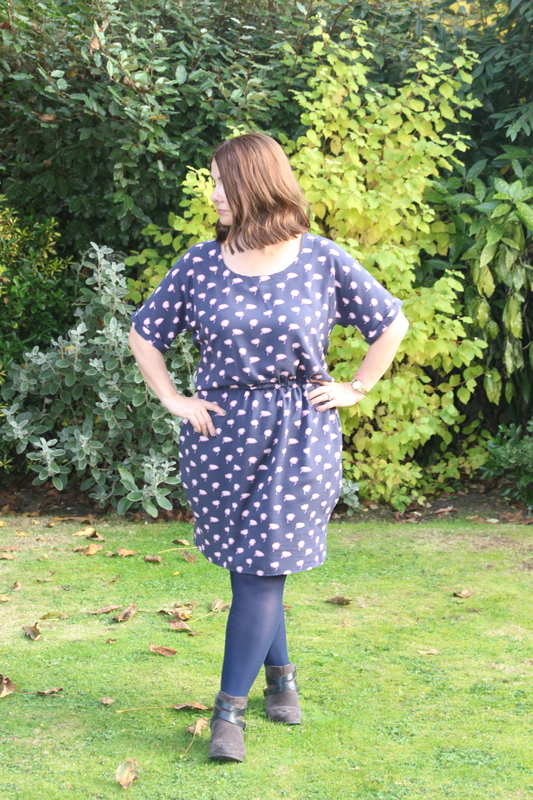 Have you made the Hemlock Tee or any other Grainline patterns that you would recommend? I’d love to hear your thoughts.. This year for my birthday, my husband scored some serious brownie points when he bought me a Janome overlocker. What a gem! It is a Janome 9200D and I had wanted one for a very long time. 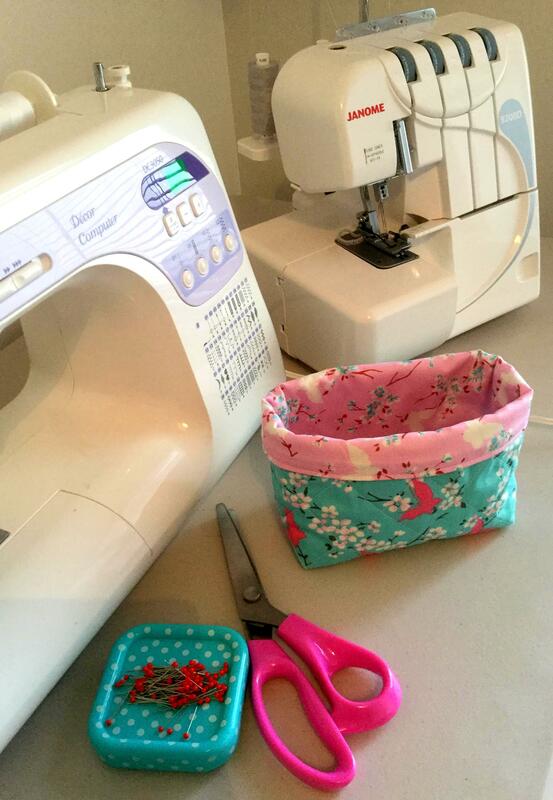 Over the course of the following couple of weeks Mr Sew Dainty asked why I hadn’t used it yet and honestly .. although I had wanted one for so long I had no idea how to use it, how to thread it or what to do! I was baffled and didn’t know where to start. I am very much a visual learner, so the idea of sitting and reading a book about it was not appealing. I turned to good old YouTube and whilst a lot of the videos were helpful, I still found the thought of using my machine intimidating. Whilst searching the internet for inspiration I recalled that a little fabric shop not that far from me held workshops and decided to look into it. The Sewing Cafe in Hinckley is a gorgeous haberdashery shop with a great range of workshops and machine hire by the hour. Imagine my delight when I found that they were very conveniently running an ‘introduction to the Overlocker’ workshop that very weekend (£40) and they had one space left. Needless to say I reserved that place immediately. I’m so pleased I did. The course ran on a Saturday afternoon in September for 2.5 hours, and was held in a lovely little workshop at the back of the store. Greeted with smiles, tea and biscuits, we were asked to select our favourite jersey fabric from the shop before we got started as we would be making a jersey snood/infinity scarf on the overlocker at the end of the session to take home with us. The course was taken by Lucy who was incredibly calm, friendly and understanding of our individual needs and abilities. We were given a really thorough explanation of the machine, learned how to thread it and how the dials worked and affected the stitch, and I gained so much confidence by being show in such a relaxed environment. Oh! Also a little touch that I thought was superb was that the lovely staff at the shop asked what model machine I had at home so that they could match me with a similar machine on the day. Brilliant! After more tea we set about making up our jersey snoods. I chose a grey jersey with a pretty turquoise polka dot, so cute. 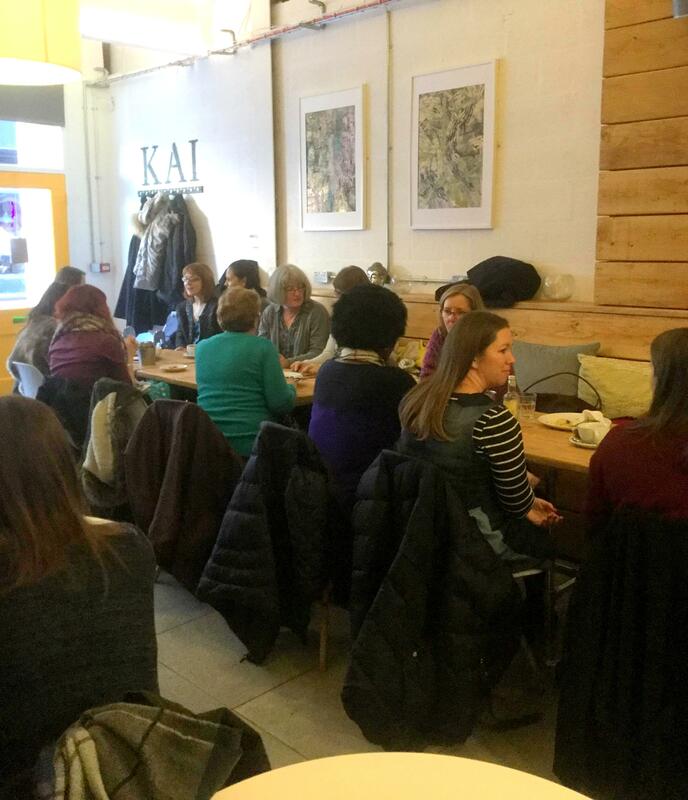 It didn’t take long to put all our new skills to the test and we were all pleased to have something to take home with us – who doesn’t love that? Since the workshop I have used my overlocker to make 2 dresses and thoroughly love the professional finish it gives not to mention the time saving element of it. I am no longer nervous about using the overlocker – in fact I can’t wait to use it again – it is definitely a case of how did I ever get by without it! I really love this machine which is not a surprise really as I already own a Janome sewing machine and it’s awesome too! So a little bit about this machine. It can be used with 3 or 4 thread options, has wide, narrow and rolled hem functions, and a colour coded threading guide. Other features are differential feed and adjustable stitch lengths and widths. It comes complete with a comprehensive instruction book, DVD, and accessories which include spare needles, tweezers and screwdrivers. 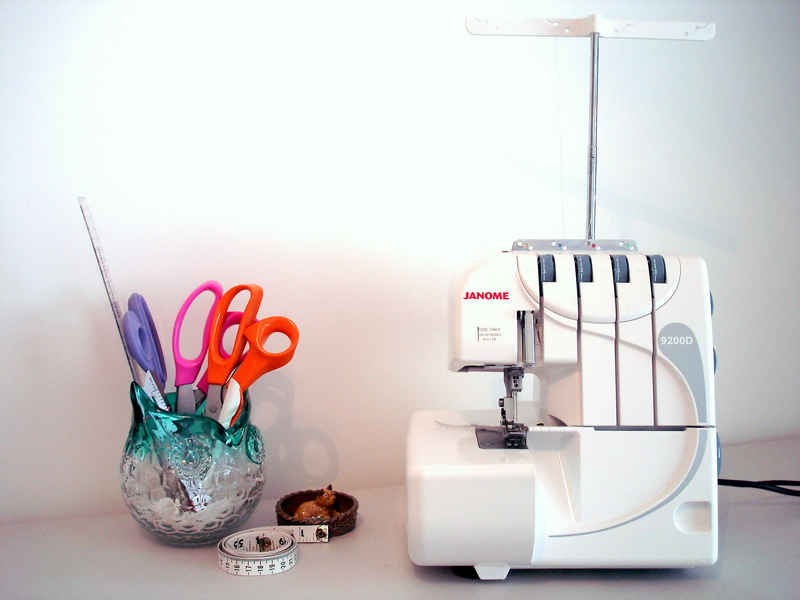 I would thoroughly recommend this machine as a beginner, it is REALLY simple to use despite my concerns and it now has a very important place alongside my Janome DC3050 sewing machine. They make a perfect duo when it comes to my dressmaking needs. So pleased with the professional finish I can now get. There are so many different ways to learn new skills now, reading, internet research and ‘hands on’ but this is a real winner for me. If you are within a reasonable travelling distance of Hinckley, Leicestershire then I would recommend a visit to the Sewing Cafe. 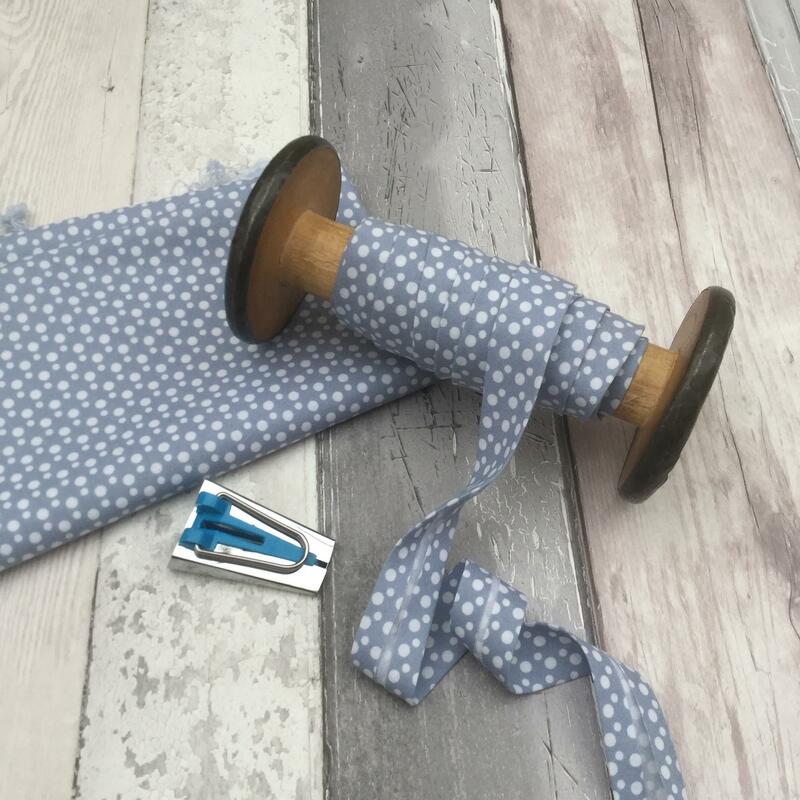 They have a fabulous range of fabrics and haberdashery, indie sewing patterns and machines and you really should check out their workshop classes – you will be tempted by several I bet! This is the snood I made at the workshop, perfect now the weather is turning cold. I do hope that this might encourage you in some way to try something different. I am the worst at giving up before I even try, but stepping out to be shown something new has worked in a really positive way for me and it will you too! Do have a look at what courses and workshops the fabric shops have on offer in your area. Have you already tried something new recently? Have you recently started using an overlocker? I would love to hear about it.